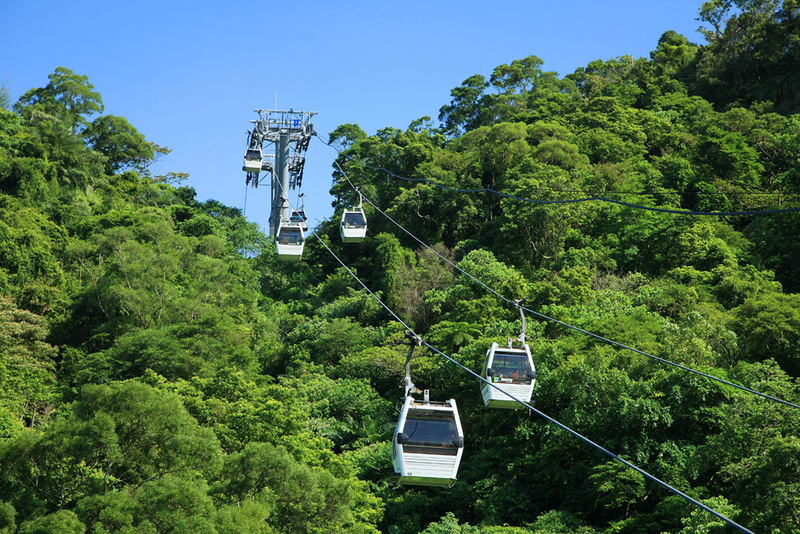 Maokong is located in the southwest of Getou Mountain in Wenshan District of Taipei outskirts. It is facing the shield of more than 500 meters high. It is said that tea farmers from southern China came here to open teahouses. Later, the teahouses declined and customers no long came. The domesticated cats ran away and thus the place was called "Maokong." However, Maokong has developed its unique sightseeing and tea tasting industry because students of nearby Chengchi University frequently hold activities here and the students' nightlife brings about prosperity in the region. The tea farms here are famous for Bouzhong tea and Taiguan Ing. There are many teahouses with diversified styles. They are good places to visit no matter during day or night. In the daytime, there are tea trees and hills forming green scenery. 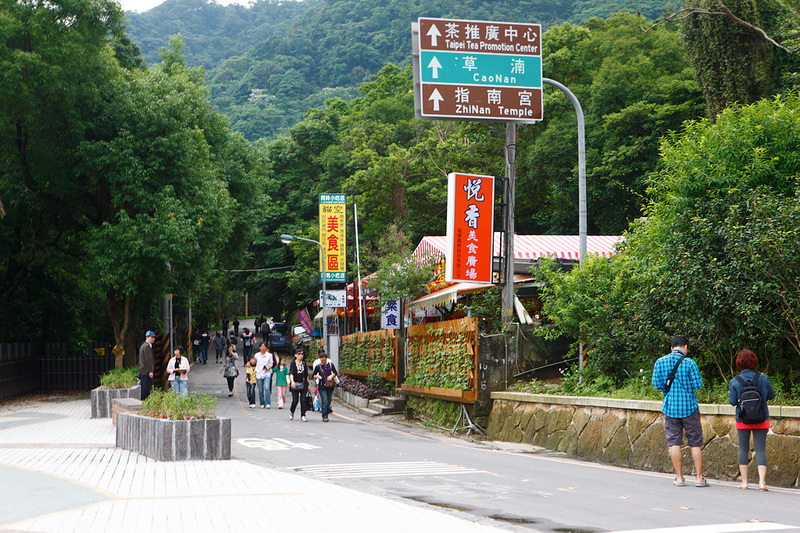 Many citizens visit the place by taking the mountain tracks. After dusk, Maokong is like an enchanting, mysterious lady. Colorful light bulbs are lit in front of every building. Visitors taste tea, chat with each other and admire the nightfall. Sometimes groups of young people have parties and the laughter brings a touch of vigor to Maokong. The tea farms (open for sightseeing) are scattered around Lane 34, 38, 40 of Zhinan Road, Sec. 3, and the former half of Zhinan Road, Sec. 3. Most tea farms provide tea tasting or meals. Recently, the sightseeing industry blooms here. Many residents develop other means of livelihood other than tea farming. For example, they raise mountain chickens or provide country cuisine. Visitors coming here may also want to try the delicious dishes. What, actually, do the famous Tie Guanyin and Baozhong teas of Muzha look like? How are they grown? In what manner should one brew the teas to bring out their optimal flavor? All the answers can be found at the Promotion Center currently managed by the Liu-Kung Agricultural Foundation. The Promotion Center includes a display area, an instructional area, an ecological pond and so on. The display area includes information regarding the tea manufacturing process, the proper way to brew it and the way to store it. The center also provides information concerning the distribution of Taiwanese teas and lectures on the art of tea for the tea novice. While appreciating the diverse variety of plants and flowers cultivated in the outdoor instructional area, one also acquires an understanding of the importance of land and water preservation. Nat'l Hwy 1 → Exit at the Yuan Mountain (Yanshan) Interchange → Jianguo Hwy Bridge → Exit at the Xinhai Rd. → Sec. 2 to Sec. 3, Xinhai Rd. → Nat'l Hwy 3A → Exit at the Wangfang Interchange → Sec. 4, Muzha Rd. → Sec. 1, Muxin Rd. → Daonan Bridge → Sec. 2 to Sec. 3, Zhinan Rd. Nat'l Hwy 3 → Exit at the Muzha Interchange → Sec. 3 to Sec. 2, Xinguang Rd. → Wanfu Bridge → Sec. 5 to Sec. 4, Muzha Rd. → Sec. 1, Muxin Rd. → Daonan Bridge → Sec. 2 to Sec. 3, Zhinan Rd.